In China, buying flu medication can turn deadly. Zhang Pu, a laborer working in Zhongshan City in Guangdong Province, was feeling under the weather with a runny nose. He asked his wife to go to a local pharmacy for some over-the-counter medication to alleviate his symptoms. His wife spent a total of 15 yuan (US$2.26) for six small bags of medicine containing a variety of flu and nasal congestion-relieving tablets. Within mere hours after he took one bag of tablets, Zhang died from a severe allergic reaction. An autopsy later revealed that Zhang was allergic to one of the tablets, paracetamol, a common drug for treating pain and fever. It turned out that the pharmacy staff who sold the drugs were not licensed, according to a report by state-run People’s Court Daily. Zheng’s widow subsequently filed a lawsuit against the pharmacy at the Second People’s Court in Zhongshan, and was awarded 485,000 yuan (about US$73,120) in compensation. The court ruled that even though the paracetamol that caused Zhang’s death was not a prescription drug, the pharmacy staff had in fact sold him prescription drugs: the medicine bag also contained prednisone acetate, an anti-inflammatory medication, and pentoxyverine citrate, commonly used to treat severe cough and bronchitis. As it turns out, Zhang’s case, which was reported in September 2016, is part of a widespread malpractice by Chinese officials and health workers. According to an investigation published by China’s state-run mouthpiece Xinhua on Nov. 20, there is an illegal industry scheme operating across the country. It starts with licensed pharmacists and doctors that rent out their practice licenses to fake drug stores, since every pharmacy needs to have a pharmacist license to run its business legally in China. Many fake pharmacies rent their licenses and pay the license owner a monthly fee. According to the investigation, the monthly fee for renting a license ranges from 800 to about 1,200 yuan (about US$120 to US$180). Some people take the pharmacy license test, not to practice pharmacy themselves, but for the sole purpose of making money from renting out licenses. These pharmacists and doctors do not have to show up for work at all—only appearing when local health officials conduct routine inspections. At two pharmacies in Nanchang City, the capital of Jiangxi Province, without the presence of a licensed pharmacist, prescriptions were filled and customers continued to buy and consume their prescription drugs. The shortage of licensed pharmacists has contributed to the malpractice. 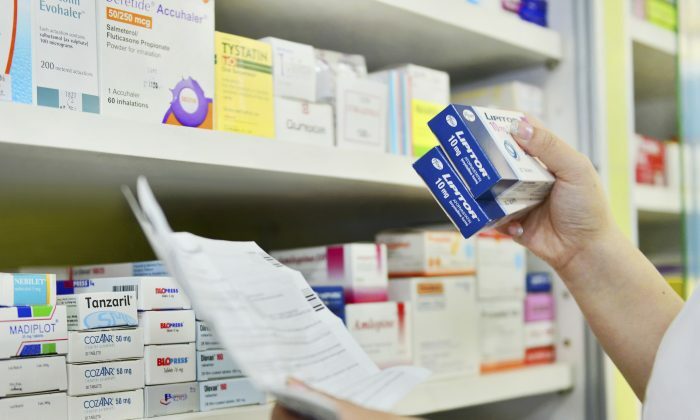 According to data from Xinhua, which cited statistics from the Certification Center for Licensed Pharmacists of China’s Center for Disease Control, the country has a total of about 450,000 pharmacies stores, but as of Sept. 30, there are only 359,954 licensed pharmacists. In Hubei Province for example, as of October 31, there are about 16,000 pharmacies in the entire province, but only 13,217 licensed pharmacists, according to state-run newspaper Guang Ming Daily, meaning there is a shortage of roughly 3,000 people. Another netizen from Guangdong Province wrote: “This is quite normal. I have not graduated [from university yet], but the license I am going to get has already been rented out to a company”—suggesting that this type of fraud is also practiced in other Chinese industries.